Tucson Unified School District is committed to providing students with the opportunity to enroll in positive and academically rigorous Dual Language programs that are designed to contribute significantly to academic achievement and provide learning experiences comparable to the District’s Advanced Learning Experiences. Tucson Unified School District recognizes the inherent linguistic and cultural diversity of its students. Within this context, dual language is incorporated as a sound programmatic response to an equal educational opportunity. Dual language incorporates each student's linguistic and cultural attributes into a total learning experience producing individuals who will be full participants in our pluralistic society while continuing to preserve, manifest and enjoy their own cultural uniqueness. Dual language is based on linguistic, sociological, psychological and pedagogical theories that emphasize learning through the use of the student's first and second languages as mediums of instruction that will result in strong bilingual and biliteracy development. The Language Acquisition Department has developed a Two-Way Dual Language (TWDL) program model for addressing the linguistic needs of our diverse student population. 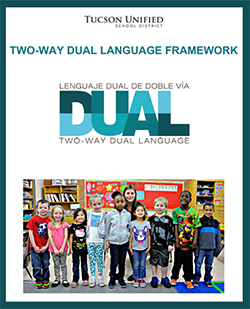 The TWDL program model provides a framework for developing and implementing a dual language instructional program. Primary and second language development are integral components of the framework. The goal of the program model is to implement the goals stated in Governing Board Policy IHAA.